A large wooden trough was discovered in a quarry in Suffolk. On examination it appears to be Iron Age and was skillfully carved from a quarter of an oak tree. The timber is high quality and came from a tree of at least 1.43m diameter. This appears to be a high quality object and if used for feasting would hold 40 – 50 litres of food or liquid. It appears that immediately before deposition the trough had been dragged by rope over a stony surface, possibly to damage it beyond use. A broken plank of oak was also found nearby. Darrah, R., 2005. 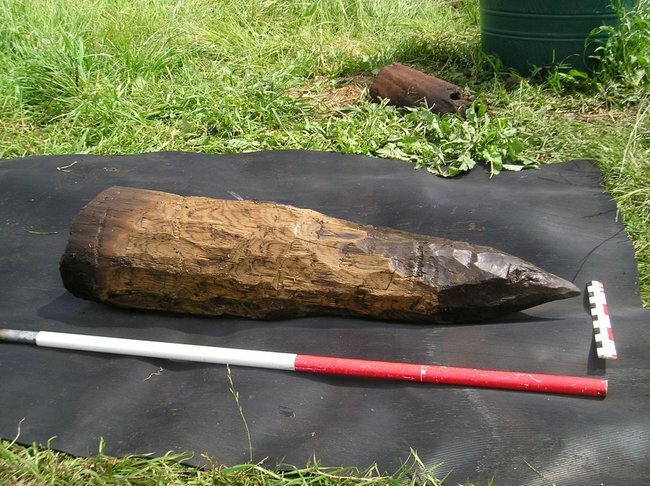 Assessment of the two wooden objects found at Badwell Ash, Suffolk. In Watson, J., Newman, J., Darrah, R., Fryer, V., The Excavation, Examination and Conservation of a Wooden Trough from Badwell Ash, Suffolk. English Heritage, 2005. pp.1-4. 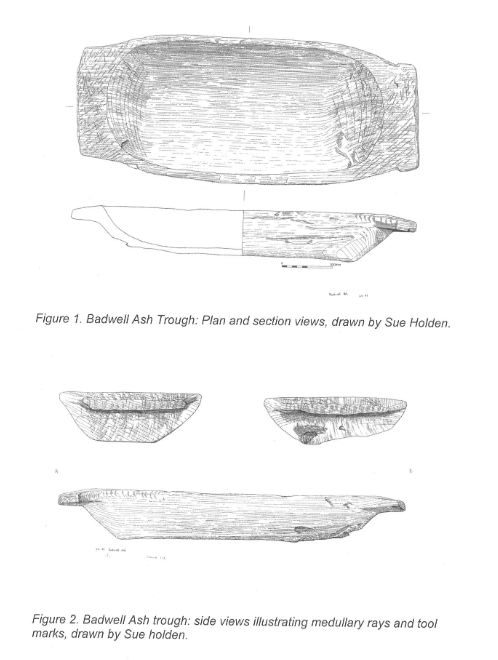 Drawings of the Badwell Ash trough, drawn by Sue Holden for the Suffolk Archaeological Unit. During the excavation of an early Iron Age well at Cottenham, a complex wooden artefact was uncovered. This consisted of 3 ash planks, joined together by 2 oak dowels, lying on an oak bar. The wood was badly decayed; however tool marks and the wood grain are still visible. The wood grain shows that at least two of the ash planks are tangential sections. Tool marks show that sharp tools, probably an axe were used. It has been suggested that this fragment is part of a wheel and although this can not be confirmed the evidence would seem to support this theory. The points of four wooden uprights from within the well were also recorded. Darrah, R., Wooden Artefacts, 1998. In Evans, C., The Lingwood Wells: Waterlogged remains form a first millennium BC settlement at Cottenham, Camridgeshire. Proceedings of the Cambridge Antiquarian Society LXXXVII, 1998. pp. 18-21. Heather Wallace Archaeology and Suffolk Archaeological Unit excavated and recorded several oak alignments across the Waveney flood plain, during construction of a flood defence in 2010. The post alignments consisted of oak trunks of up to 0.3m diameter with long tapering axe-cut points. Part of an oak post from an alignment across the Waveney flood plain. The preservation is so good that the sapwood is still pale, and the axe cuts are clearly visible. Photo © Richard Darrah.